Chart based on 73 repairs. 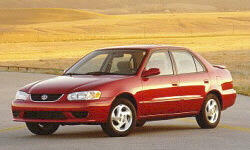 See TSBs and recalls for the 2001 Toyota Corolla. Chart based on 66 repair trips. The repair cost chart excludes repairs made under warranty, do-it-yourself repairs, and repair trips that include maintenance. 134000 mi Burning about a quart of oil a month when sold. Once I checked the oil and almost nothing at all showed up on the dipstick (it took 2 quarts to get it to halfway full) but the oil pressure warning light had not come on. Had developed a vibration/noise from the right rear wheel -- frequency proportional to my speed and occurred at every speed. CEL. My mechanic checked code, told me for catalytic converter. Advised me not to replace it, saying he'd often seen Corollas throw that code when nothing really wrong with catalytic converter. C $100 Rattles noise when left turn and slow down. Notice the strap of Muffler was broken. The shop just replaced the strap, the problem remains. 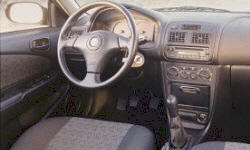 US $35 Replaced passenger side electric window switch. US $650 Blown spark plugs; replaced. Check engine light checked - Oxygen sensor bad (not replaced), MAP Sensor replaced. US $400 Plugs replaced. Oil Changed. PCV replaced. US $450 Oxygen sensor replaced. Plugs replaced. Determined to have a stuck piston ring (not repaired). US $130 Plugs fouled b/c of stuck piston ring - plugs replaced. US $60 drivers side front window motor unable to fully lift or lower window. replaced window motor unit and greased regulator. problem fixed. US $150 Replaced both oxygen sensors to eliminate pinging. US $220 Drive shaft was leaking grease out of boot. shaft replaced. US $7 Replaced driver interior door handle. 2nd time in 2.5 years. US $100 Front bearings replaced. US $330 Replaced front brake rotors and pads. Flushed brake system. Replaced serpentine belt. 171000 mi It is burning oil. About four quarts in between each oil change. Never actually got fixed, just keep filling it up. 98580 mi Signficiant oil burning. Approx 1 litre + per month. US $100 Serpentine belt beginning to show signs of wear. Needs to be eventually replaced. US $458 Catalytic converter and oxygen sensor replaced. Check engine light had come on. 123000 mi The original cat converter failed, was replaced with a non oem model, after a few weeks it failed, and then the shop replaced it with an upgraded better model, so far it's been ok. US $265 Power steering pump leak. US $52 Cat Converter replaced again 2nd time by Midas. Part was not genuine Toyota part. US $100 Replaced front stabilizer links. C $1500 Replacement of worn regular shocks and struts with heavy duty, lifetime-warrantied ones, partly due to regular commuting at very cold temperatures (down to -40C) on ice rutted roads with heavy passenger loads. 99000 mi Replaced worn-oout timing belt. US $400 Shoes leaked, master brake cylinder lost pressure, squishy brakes. Replaced shoes, rotors were machined, full brake fluid replacement. US $350 Mass Air Flow sensor. I replaced it. Also did the PCV valve, which was a little gummy. US $25 Turn signal switch went bad--replaced with a junk yard part from a Prizm. US $400 I replaced the rear struts. Sway bar linkages had to be replaced too. They were worn enough that the tire dragged when there was little weight in the back. Factory pieces were completely intact, but a little rusty. Suspension was all factory OEM. US $100 I replaced the front passenger wheel bearing. Replaced the original front brakes and rotors while I was at it, though they were (unbelievably) still good at 121k. 129000 mi Throttle to transmission cable (NOT throttle cable, the other one) was sticking so it read as always being an open throttle. I repositioned the cable so the cable retracts again. US $25 VSV (vacuum switching valve) changed at charcoal canister. Now my CEL is off. Aesthetic change only, but worth it. The old one was rusty and totally dead. US $50 Replaced timing chain tensioner due to leaking o-ring. US $35 Replaced idle air controller. May not have been real cause of rough low idle, but it seems to be a little better. US $220 The windshield washer container cracked open and had to be replaced. US $93 Recharged AC. No leaks found. 83480 mi It is burning oil started from 3 years ago. I need to add 1 liter oil for every 5000KM. Now, it generates blue smoke after driving down a long downhill road with engine break. On normal road it is fine. We decided not to fix it due to cost. C $200 Engine light was on. It used too much gas. The repair shop changed spark plugs and a circuit. US $550 Rear struts were worn out. US $50 broken power steering pump. inside drivers door handle broke off. US $150 Replaced passenger side front tie rods. US $350 Driver side front and passenger rear sway bars replaced. US $150 Replace right front sway bar. Could not open passenger door, lock mechanism rusted until not functional. 217000 mi Burned 1quart of oil per tank. US $30 Slight vibration and steering wheel shake at freeway speeds. Tires were rotated and balanced. US $150 Oil leak. Replaced the valve cover gasket. US $800 Vibration at highway speed. Found tires had flat spots (octagonal rather than round) due to worn rears struts. Struts replaced (tires too, but I didn't include that in repair cost). 113000 mi Vibration at highway speeds, worse under engine load and acceleration. See our lemon odds and nada odds page to see vehicles with no repairs or vehicles with more than three repairs. To see how frequently 2001 Toyota Corolla problems occur, check out our car reliability stats.